Salvation And Survival: Aww, C'mon! PB&J Is Now Rascist?!?! Aww, C'mon! PB&J Is Now Rascist?!?! While this post may be considered "old news" in this internet age, I feel the premise begs examination for its' distorted and biased perspective. I'm beginning to think that they're putting something in the water on both Coasts (which isn't as far-fetched as you might think!) We all know that the East Coast Elites have a skewed image of how we, the unwashed masses, should live our lives. You know ..... no guns, no God, but lots of government. Now it seems that the West Coast has produced its own brand of idiotic theories. You're not going to believe this! 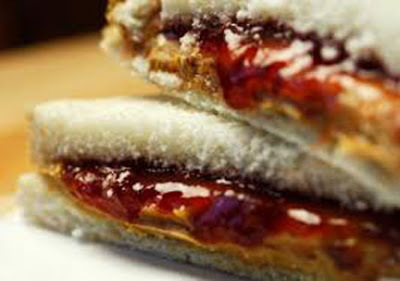 But it seems, according to a Portland, Oregon elementary school Principal, that Peanut Butter and Jelly sandwiches are now an expression of discrimination, and teachers must overcome their "white privilege" when mentioning the popular cuisine, especially in class lessons. Are you kidding me???? I'm going to try very hard to maintain a balanced approach here, but there are times my self-restraint is sorely tested. Here is the Principal's logic: “What about Somali or Hispanic students, who might not eat sandwiches?,” she said. “Another way [the teacher could explain her lesson] would be to say: ‘Americans eat peanut butter and jelly, do you have anything like that?’ Let them tell you. Maybe they eat torta. Or pita.” Right off the bat, I'm sensing that the word Americans leaves a bad taste in this Principal's mouth. By this administrator's reasoning, the teacher got it all wrong when she mentioned the favorite sandwich of all generations, without also mentioning other food choices. Apparently, this was a blatant practice of discrimination. So how to combat the insensitivity of teachers? (You're not gonna believe this!) Portland Public Schools have initiated an "equity training" program called "Courageous Conversations." Educators now have to go through intensive staff trainings, frequent staff meetings, classroom observations and other initiatives, in order to come to terms with their inherent racism. I'll let the Portland Principal explain just how this program will help teachers become more empathetic towards their students: "The premise is that if educators can understand their own “white privilege,” then they can change their teaching practices to boost minority students’ performance." And the school system has wasted no time in implementing their "equitable" ideology. On the staff's first day of school, the order of the day was to have a Courageous Conversation, to examine a news article, and then discuss the “white privilege” it conveys. Is the anger and the venom not apparent to anyone else but me? And I don't understand it. Here's what you need to know about the Principal, Verenice Gutierrez. She is the child of Mexican immigrants; her parents came to this country knowing that it offered a better life for their children. Does she honestly think she would be better off in Mexico? Would she have had the opportunities there that she's had in America? I'm getting pretty tired of people (no matter their race or their culture!) who benefit from the unlimited chances, opportunities and dreams that America offers, and then feel that somehow they've been slighted! And I'm tired of their racist rants! Which marxist professor came up with the bigoted label "white privilege" and then convinced the minority student that they were a "victim"? And then convinces them they see prejudice and inequality behind every .... um ..... peanut butter and jelly sandwich?!?! I would like to have my own little "Conversation" with Ms. Gutierrez. Instead of "Courageous", mine will be more like "Candid." Instead of examining how I, as a white woman, view people, circumstances, and social institutions through my lens of "privilege", let's examine the magnifying glass with which you look for every imagined insult, slight and slur. Just think how much wider your line of sight would be if you weren't so consumed with identifying every possible injury. Why can't you promote all the ways that our different heritages cultivate a unique American spirit? You say that you are trying to bring equality to the races, but in fact, you separate us even more by pointing out our differences, instead of embracing them. And once and for all, we all need to realize that everything can't be equal! This race is included among the greatest athletes of all time; this race produces brilliant Engineers; while this gender has better reasoning and logic; and that age group makes higher salaries. Do you want to label and discriminate against all of them? They all have the OPPORTUNITY to pursue ANY or ALL of these avenues and become the best they can be. Should we treat everyone fairly? Yes! Can we all be the same and receive the same exact spiritual gifts, intelligence and beauty? Of course not! Get real and quit whining! Be thankful that you live in the greatest country on earth where you have been given the chance to succeed. Whether you believe it or not, YOU and your attitude are the only things standing in your way. Galatians 5:25-26 "Since we live by the Spirit, let us keep in step with the Spirit. Let us not become conceited, provoking and envying each other." Dang! What's next??!!?? Fried chicken? Oh, wait, they already got that one. If you've never been to Portland, OR, then you need to know that it's quite possible the most liberal city in the USA, with only San Francisco being possibly worse. Portland is actually the "sister city" of Austin, TX, so now it all makes sense, doesn't it? My husband was born in Mexico. He moved to California when he was 16. He had a hard time adjusting at first, because his family was still in Mexico. He knew in order to succeed in the US he would have to learn English, which he did. He saw the opportunities that are available if you are willing to work hard. It was his dream to be self-employed and to own his own home. In 1982 we started a printing business and purchased our first home. Our business was successful for many years, because we worked hard. It's in decline now, but that's another subject. We've thought about retiring in Mexico but it's my husband who wants to stay in the US. He loves this country and appreciates what he was able to achieve through determination and hard work. My husband never asked for equality of results only the opportunity to succeed. He understands maybe better than I do the American Dream. Stories like that of your husband's portray the true American story. We ARE a land of immigrants who long for the possibilities that America offers; they expect to work hard for the opportunity, and are rewarded with success. They don't take that success or their liberty for granted, and are truly grateful to be called Americans. They are not identified by skin color or nationality; they are Americans by virtue of adopting the American spirit and achieving the American dream. I am proud to call him my countryman! America is a land of liberties, ideals, dreams and opportunities. From the colonial experience that was Jamestown to the next small business that wants to start out offering a product, service or idea...America is the embodiment of the dreams of human nature. From my time in the military, to all the reading and associations with the prepper network, there's nothing that defines America more than the desire to work hard and live free. And there's nothing less to define an American than somebody else's ideas of skin color, DNA or entitlement. America is the first, best and only experiment in self-government that has worked successfully, as far as I know. For those who are the beneficiaries of her promises to declare that they are "victimized" is the height of hypocrisy. They don't know what "to be an American" truly means.